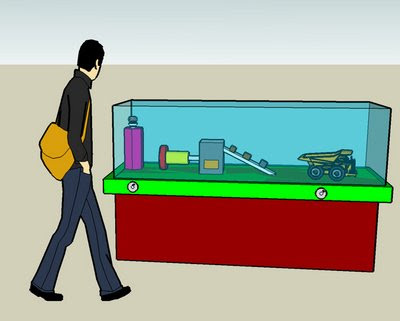 Exhibit Design: Museum SketchUp Group? I mention SketchUp Basecamp, not to regale you with my upcoming travel schedule, but rather to solicit interest in a Museum/Exhibits related SketchUp group. Do you use SketchUp? Would you be willing to share and trade ideas, and SketchUp renderings in one handy accessible spot? If there is enough interest, I'd love to set up a Google SketchUp group for Museum and Exhibits folks. Leave your contact info in the Comments Section below, or send me an email to indicate your interest. UPDATE: A Museum and Exhibits SketchUp Group has been created! Get more info by clicking here. Also check out the Museum and Exhibits Collection in the Google 3D Warehouse as well. This could be a cool idea! I sent you an email. I just wanted to let you know that we still have a workshop at our very small science museum in northern Minnesota. We can not afford to hire others to build and repair exhibits so out of necessity we must keep some form of workshop space. I am shocked to hear that bigger museums opt to eliminate this vital part of operations. love sketchup. easy and fast. Sketchup has come in handy when pitching concepts to people who have a hard time visualizing. I think can be a useful tool. I'd love to get involved with this idea. Check out the updated information in the post above to join the new Museum and Exhibits SketchUp group.